Factors including the falling gas production from its blocks in the Krishna Godavari basin, to the heavy investment planned for its telecom venture have weighed on the returns given by the stock. Mumbai: Shares of Reliance Industries Ltd (RIL) underperformed the market benchmark S&P BSE Sensex for the seventh consecutive year in 2014, and the performance gap between the two is seen widening in the current year, said analysts. In 2014, while the Sensex gained 31.72%, RIL shares rose by a mere 0.49%. 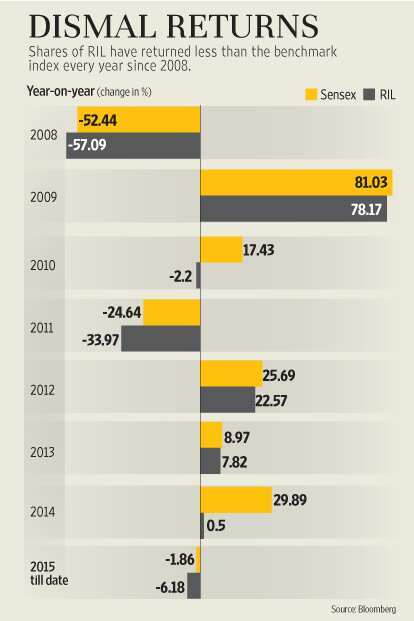 RIL shares have returned less than the benchmark index since 2008, but last year’s performance gap is the widest. The new year did not start well either, with the RIL share falling 6.18% in its first four trading days, against a 1.86% fall in the Sensex. Over the years, factors including the falling gas production from its blocks in the Krishna Godavari (KG) basin, to the heavy investment planned for its telecom venture have weighed on the returns given by the stock, but the list of woes expanded in the year just ended. A much-delayed increase in the domestic natural gas price did not prove to be a positive trigger for the company as the increase in price was less than expected. Besides, the company was not eligible for the increased price for two of its fields due to an ongoing arbitration between the government and the company. To add to this, weakening demand for petroleum products has pulled down the company’s gross refining margins (GRMs). This was worsened by the fall in the price of petrochemical products as well as falling crude and tumbling cotton prices. These factors have combined to impact the price of one of its biggest petchem products—polyester—besides hurting other petrochemical products as well. The company’s exploration and production (E&P) business seems to hang heavy. “We believe the sharp underperformance this year was driven by further negative developments in E&P (the low gas price hike virtually ensures that investment in E&P is unlikely to begin anytime soon), high and rising spend in telecom (with not much clarity yet on the timing and offering) and also a relatively weak petchem cycle," said analysts Anil Sharma and Ravi Adukia of brokerage house Nomura in an 18 December report. One of the more recent concerns that has emerged for the conglomerate is the fall in global crude prices, which has delayed an anticipated uptick in the petrochemical cycle. At the same time, falling cotton prices are depressing the price of polyester—one of the biggest pieces of RIL’s petchem division. 58% of the total petchem capacity comprises of polyester and polyester intermediates. “While new petchem capacities will be a key driver for earnings growth in FY16, we believe significantly lower cotton and oil prices year-to-date (-28% and -37%, respectively) will limit the upside to RIL’s near-term earnings," said a 2 December report by international brokerage JPMorgan Securities Llc. The report adds that with a forecasted 33% of total Ebitda (earnings before interest, taxes, depreciation and amortization, or operating margin) coming from petchem, there will be a negative impact on RIL’s earnings with lower oil prices. A mail sent to RIL on 12 December asking about the impact of falling cotton prices and the trend of the current petchem cycle remained unanswered. The petchem operations contribute roughly 20% to the overall revenues and 33% to the overall operating profits of the company, while refining contributes the maximum with 75% of revenues and 52% of operating profits, as per RIL’s fiscal 2014 results. RIL has petrochemical manufacturing units at 12 locations across India, which together produce up to 15.5 million tonnes per annum (mtpa) of various petrochemical products and their derivatives. Major items on RIL’s menu of 20-odd petrochemicals include cracker products and polymers such as ethylene, polyethylene or polythene (PE); polyesters and polyester intermediates such as paraxylene (PX), purified terephthalic acid (PTA), mono-ethylene glycol (MEG), polyethylene terephthalate (PET), polyester filament yarn (PSY), polyester staple fibre (PSF) and chemicals such as benzene, butyl rubber etc. “...given the historic lows in crude, and still falling, crude prices have impacted all petrochemical products, including PX, MEG and PTA, and PET/Polyester. This has been complemented by a very low demand of these products globally," Prema Viswanathan, associate editorial director—petrochemicals at Platts, a global energy information provider, said in an email response. Further, with increasing inventories of cotton in China and higher production in India, there is a downward pressure on polyester as cotton and polyester are competing products, said Viswanathan. A fall in GRMs to $8.3 per barrel in the July-September quarter from $8.7 per barrel in the preceding quarter, along with a sharp fall in global petrol and diesel prices are other factors which have impacted the stock in the current calendar year. To be sure, analysts expect some of the under-performance to be addressed once its expansion plans start to come on stream. For instance, RIL is in the last leg of a mega petchem expansion, under which the company is increasing its overall capacity by 66% by fiscal 2017. Its fourth generation telecom services are expected to be rolled out in 2015. “...focus is also likely to be on the fast-completing petchem/ refining expansion plans which should further increase RIL’s competitive advantage, and be a key driver of 70% earnings growth over the next four years. While telecom is likely to be a key driver for the stock in 2015F, we believe petchem/refining growth will bring an end to the long phase of RIL’s underperformance soon," noted the Nomura report quoted above. However, not all analysts are convinced that the expansion will pay off quickly. In a report dated 8 December, Bank of America Merrill Lynch cut its FY16-17 EPS (earnings per share) estimate for RIL by 2-6%, “due to the higher-than-expected loss ( ₹ 53-54 bn vs ₹ 30-50 bn) for its telecom subsidiary Reliance-Jio, delayed start up of its cracker (2Q16 vs 4Q15) and coke gasification (all modules commissioning by March ’16 vs 4Q15).